Home » The dress of the Arabs. Affluent class. The name Arab originally was reserved for the nomad tribes east of Palestine and in the Syro-Arabian desert, but today it is generally used for most of the surviving Semitic peoples who, in addition to living in Arabia, are to be found in Mesopotamia, North Africa, the western shores of the Red Sea, and the eastern shores of the Persian Gulf. They are predominantly Moslem, with aquiline noses, deep-set dark eyes, long limbs and lean bodies. The two figures pictured here represent a slightly more affluent class than those on Plate 6. 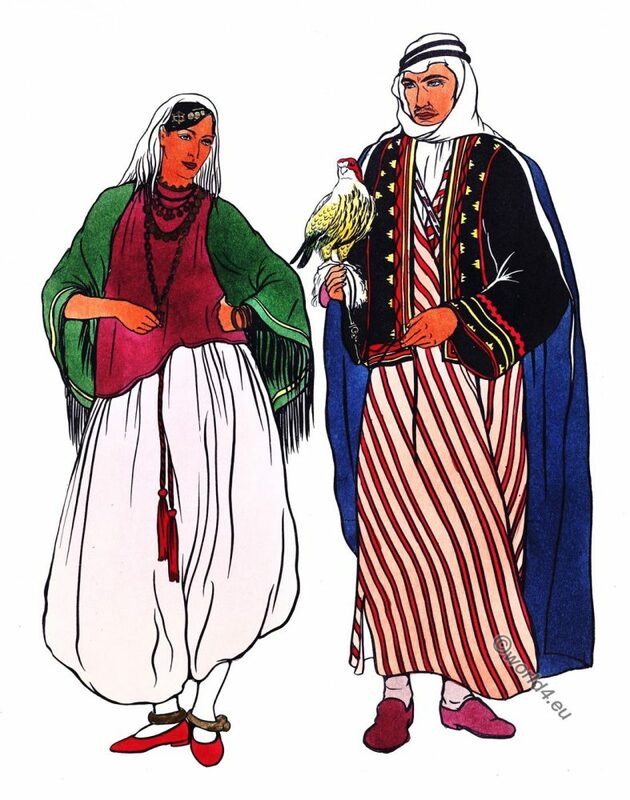 The woman’s costume is not unlike the indoor dress of various other nationalities of the Near East. If she were in the city and were going out of doors, she might take the shawl trailing from her head and conceal her face, leaving only her eyes visible. Her ensemble consists of a bloµse, trousers, and a shawl or cape. The blouse fits very loosely, is short-sleeved, and is more than likely of silk, though very many other materials are known and worn by the people of the East. Her trousers are extremely full, so baggy as to form almost &. skirt. They are drawn in at the waist with a draw-string that terminates in two long, red silken tassels. Over all she wears a fringed, green woolen shawl. Her legs are covered with white stockings; and she wears on her feet the usual soft, red morocco slippers. In her hair, which she has drawn back from her face, she wears some old coins and a gold ornament which are strung on a cord tied about her head. She also wears a fringed silk kerchief. Note the jewelry-necklaces of coins, heavy gold bracelets. The man is dressed quite similarly to his compatriot on Plate 6. His dress is, however, more luxuriant. Visible at his chest is the long loose shirt of white cotton, over which is worn the aba. In this instance there is a short split on either side of the bottom hem. Undoubtedly it is made of camel hair. Over the aba, he wears a short woolen jacket with long wide sleeves. Note that it is beautifully embroidered down the front ru1d at the cuffs. His headdress is the same kubiyah and sakal described on Plate 6. Notice, however, that it has been twisted and thrown back over one shoulder to frame the face. His stockings are of cotton and his shoes of a fine soft leather. He completes the ensemble with dashing cape flowing from the shoulders. He wears on his right wrist a heavy sheepskin pad to keep the claws of his pet falcon from cutting him. The mediaeval art of falconry is still practiced by many Arab tribes. Probably it was brought to England by the Crusaders from these very Arabs.